One year ago today, at this very moment, my dad and I were on a Northwest Airlines plane somewhere over the Pacific Ocean, approximately 2-3 hours off the coast of Oahu. I had an extensively detailed To-Do list for the next 3 days which included tasks like get house, buy car, furnish house, get car insurance, find WalMart. My dad was my grounding force as I embarked on the crazy three/five day mission of getting a house and settling into it, as well as buying the Escape and getting all of the necessary paperwork complete to drive it. He helped me furnish the kitchen and he helped me set up shelves, the DVD player, and the appliances. He helped me salvage a night stand, a dresser, a TV stand, a 5 ft mirror, and some faux rocking chairs from the side of the road [FREE!] and he helped me scour garage sales to find great deals on everything from power tools to a patio furniture set. I didn't freak out at all during those few days, either. Or at least not very much. We dealt with the Hawaiian winter rain, encountered some cockroaches, drove around the island and explored some Hawaiian gardens. We bonded. It's been one year since I left Minnesota [after waiting patiently/impatiently for MONTHS] and headed to Oahu. Matt had about 6 weeks left in Iraq and I kept myself busy by setting up our house, buying a car, furnishing the house, learning the island, making sure everything was perfect for his return, and hitting the beach as often as I could. Then, on March 1st 2009, Matt returned and our life together in paradise began. 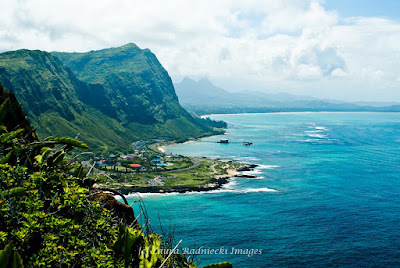 I have to admit that I feel extremely nostalgic and sad when I think about packing for Hawaii, settling in, and then exploring the island for the majority of 2009. How can I not, when the views look like the photo above? With no deployments to plan for, we were simply allowed to enjoy each other's company and the beauty of the island around us. It was really great for us and for our marriage. Hawaii, you're in my heart today [and always!]. Thanks for the fantastic year that I was able to call you home. Someday, we'll be back.